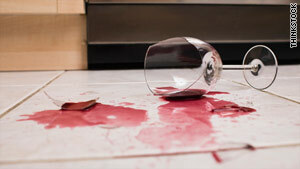 High blood pressure combined with binge drinking can lead to deadly consequences. Researchers found an increased risk for lethal heart attacks and strokes. (Health.com) -- It's no secret that high blood pressure increases your risk of heart disease and stroke. Nor should it come as a surprise that binge drinking isn't the healthiest habit. But a new study suggests that combining the two may add up to double the trouble -- and much more, in some cases. Compared with teetotalers with normal blood pressure, men with high blood pressure (hypertension) who even occasionally down more than six drinks in one sitting have nearly double the risk of dying from a stroke or heart attack, according to the study, which followed 6,100 South Koreans age 55 and up for two decades. "Somehow the binge drinking compounds [high blood pressure] -- and more than just a little bit," says Brian Silver, M.D., a neurologist at Henry Ford Hospital, in Detroit, Michigan, and a spokesman for the American Heart Association. Still, the findings ring true, says J. Chad Teeters, M.D., a cardiologist at the University of Rochester Medical Center, in New York. Men with severe high blood pressure are at even greater risk, according to the study. If those men have six drinks in one sitting, their risk of a deadly stroke or heart attack quadruples compared with that of a nondrinker with normal blood pressure. If they consume 12 drinks in a sitting, their risk increases 12-fold. On their own, both binge drinking and hypertension up the risk of fatal stroke or heart attack. Regardless of whether they drank alcohol, the men in the study were twice as likely to die from a cardiovascular problem if they had hypertension -- as were the heavy binge drinkers, regardless of their blood pressure. Health.com: Can alcohol actually be good for you? "There's something about alcohol that makes the blood vessels more vulnerable to plaque formation and plaque rupture," says Silver, who was not involved in the new research. "Binge drinking is probably not a good idea anyway. Uncontrolled hypertension is not a good idea. The combination is worse," says Robert Myerburg, M.D., a cardiologist and professor of medicine at the University of Miami Miller School of Medicine.